“If you’ve been in Denver very long, you’ll notice there’s a homeless problem,” said Empower Network COO Jerry Ballard. When Empower Network came to Denver’s Bellco Theater in July for its quarterly conference, it didn’t just give a presentation. It gave a $10,000 check to help the city’s homeless community. 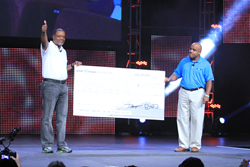 Empower Network presented the check to CEO Bennie Milliner of Denver’s Road Home. Denver’s Road Home is working through a 10-year plan to end homelessness in the city. Now in its seventh year of the plan, Denver’s Road Home has created 2,653 housing opportunities for the homeless, prevented 5,871 families and individuals from becoming homeless and mentored 1,058 families and seniors out of homelessness. Denver’s homeless problem is a major issue in the city. There are more than 11,000 homeless men, women and children in the metro Denver area. Of those, nearly 1,000 are living unsheltered on the streets, under bridges or in public buildings. Empower Network co-founders David Wood and David Sharpe are no strangers to homelessness. Years ago and at different times in their lives, they were each homeless. Today, after putting their collective talents to work and enjoying a real-life rags-to-riches American dream, they run a $60 million company and want to give back. Prior to this donation, Empower Network raised $66,000 for Austin, Texas’ Habitat for Humanity and more than $30,000 for the American Red Cross in support of the Boston Marathon Bombing victims. This most recent donation to Denver’s Road Home will help the organization feed, clothe and house homeless residents. Denver’s Road Home is the local affiliate of 100,000 Homes, a national movement of 205 communities working together to find permanent homes for 100,000 of the country’s most vulnerable homeless individuals and families by July 2014. Empower Network is a new national sponsor of 100,000 Homes. Empower Network hosts one of the largest blogging communities and publishing platforms online in addition to providing educational training products and services to online marketers and start-up, home-based and small businesses. Empower Network offers a program through which affiliates can earn commissions off the sales of Empower Network products. Headquartered in St. Petersburg, Fla., David Wood and David Sharpe founded Empower Network in 2011 to empower small-business owners to make money online without dealing with the technical, marketing, payroll and overhead challenges that frustrate many entrepreneurs and small-business owners. Empower Network’s signature product is a viral blogging system geared toward helping its 30,000 affiliates and 70,000 members use the Internet to grow their businesses online, taking them from disenfranchisement to full self-empowerment through the use of blogs, direct sales and online marketing. Visit http://www.empowernetwork.com for more information.